I ADORE this recipe, and I’m not a carrot fan, so that’s a testament to this recipe’s deliciousness. It is virtually impossible to get me to consume the root vegetable known as a carrot. It always seemed to me that it was hidden in the ground for a reason. People who can munch on raw carrots baffle me. Do they also chew on raw potatoes? I discovered, quite by chance, that carrots can be made edible much the same way sweet potatoes are, by pulverizing them in the microwave until they are delectably soft. How did I discover this, you ask? A bout of dyslexia when entering in the time setting on the microwave. What a happy mistake! ALL of the above text is to say, I hate carrots, yet I love this recipe AND my recommended microwave time may need to be adjusted if you’re one of those raw carrot eaters. Wash, trim, and peel carrots. Chop into 1/4-inch slices. Steam carrots, covered, for 10 minutes or until desired tenderness. Heat butter in large nonstick skillet over medium heat. Add garlic and ginger to pan; cook 1 minute, stirring constantly. Add coriander; cook 1 minute. Remove from heat; stir in carrots. 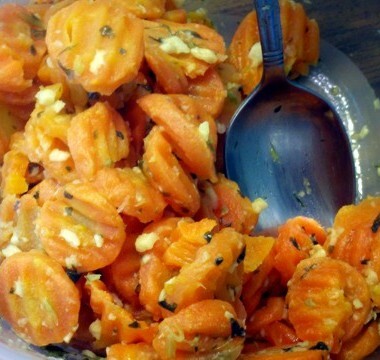 Empty frozen carrots into microwave steamer bagand microwave for 8 minutes or until desired tenderness. Heat butter in large nonstick skillet over medium heat. Add garlic to pan; cook 1 minute, stirring constantly. Add coriander and ginger to pan; cook 1 minute. Remove from heat; stir in carrots.